If you saw our interview with Hasbro’s Star Wars team at Comic-Con, you know that they’re trying to keep completely secret which new toys will be revealed on “Force Friday” in September. You also know that apart from the 6-inch scale TIE fighter they revealed, we coaxed some tidbits out of them, like that an all-chrome figure isn’t happening yet (sorry, Captain Phasma!) and an environment/playset probably is. Okay. 3.75 characters are definitely a part of it, though we don’t know if they’ll just be the more basic five-points-of-articulation figures aimed at kids rather than the more articulated, smaller Black Series. There will also be a First Order Star Destroyer playset, priced at $39.99, which implies it’ll be some sort of bridge display rather than a full vehicle; and a Millennium Falcon for 3.75 figures, priced at $139.99, which will almost certainly NOT be the “BMF” large-scale Falcon made for the original trilogy. For one thing, it’s slightly cheaper, and for another, Hasbro told me they weren’t rereleasing that one just yet. It probably won’t be the original mold either, since the BMF was made because the original mold had been damaged, so most likely it’ll split the difference as an all-new toy that’s closer to the old one than its successor. 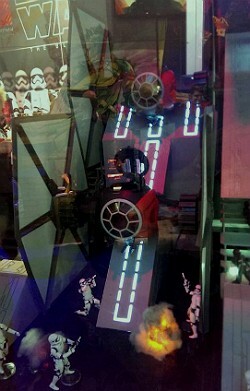 Check out all their pictures of the shelf tags, and the price on that Yoda, for more speculation. Is there anything in particular you’re hoping to see?